The After School Art Studio program invites serious teen and adult art students to build their portfolios. Regardless of medium, there is no substitute for the mastery of time-honored drawing skills that involve a thorough understanding of classical form and technique, individually taught by a master. This program is designed to foster a long-term commitment to artistic development that prepares students for continued study at any art school or atelier in the world. After School Art Studio | Tues. and/or Wed. Classes are small, focused and fun. 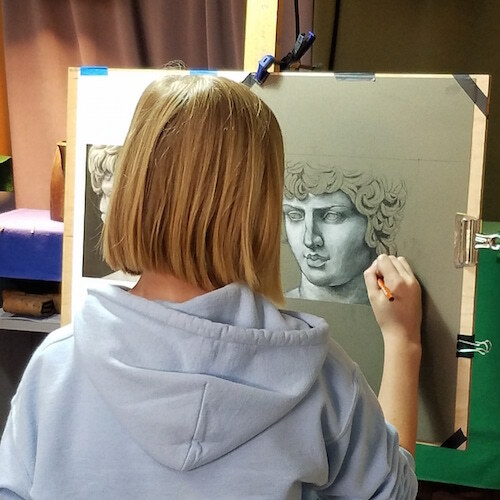 This program is designed as a long-term commitment to artistic development that will prepare students for continued study at any art school or atelier in the world, as we specialize in the classical skill set. After registration we collect a periodic Materials and Studio Maintenance Fee of $48 which is collected again in two months. Full time students may pay the same amount monthly. This Materials and Studio Maintenance Fee provides the student body with general materials we all share and keeps the studio functional for everyone's benefit. It supplies nearly all drawing materials. Students will still need personal items such as brushes and painting surfaces befitting a well trained and prepared Artist. Thank you for supporting the studio.